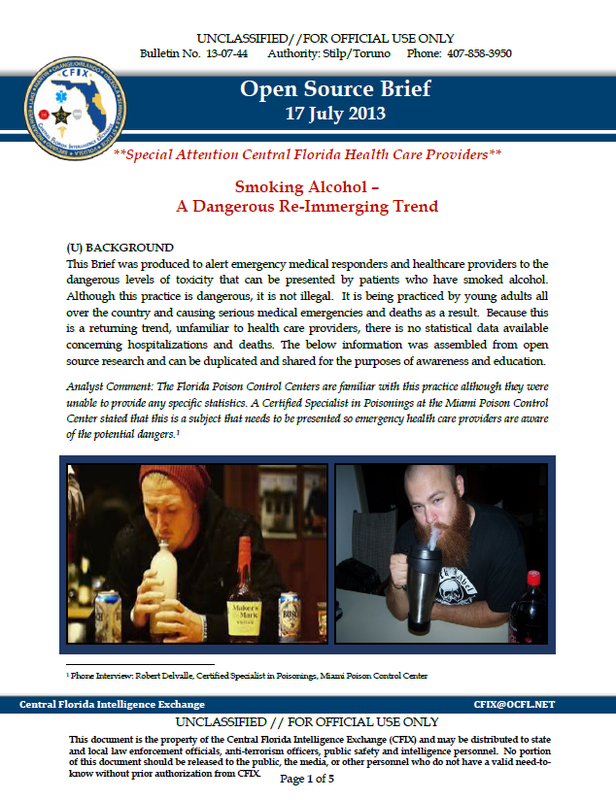 This Brief was produced to alert emergency medical responders and healthcare providers to the dangerous levels of toxicity that can be presented by patients who have smoked alcohol. Although this practice is dangerous, it is not illegal. It is being practiced by young adults all over the country and causing serious medical emergencies and deaths as a result. Because this is a returning trend, unfamiliar to health care providers, there is no statistical data available concerning hospitalizations and deaths. The below information was assembled from open source research and can be duplicated and shared for the purposes of awareness and education. Smoking alcohol first occurred in the U.S. in 2004 with the marketing of an alcohol nebulizer called Alcohol With-Out Liquid or AWOL. When this product was outlawed in the U.S. the fad seemed to disappear. Based on numerous news reports and internet propaganda, in the last two years smoking alcohol has increased dramatically in both the high school and college student population. Unlike drinking alcohol, where both vomiting and liver action plays a role in detoxification, this form of alcohol intake is dangerous, can trigger a medical emergency and lead to death. Analyst Comment: Emergency medical personnel need to be aware of this practice, be ready to treat patients who overdose on alcohol and report incidents to Poison Control. Several different processes are used to release the alcohol from any over the counter alcoholic beverage. 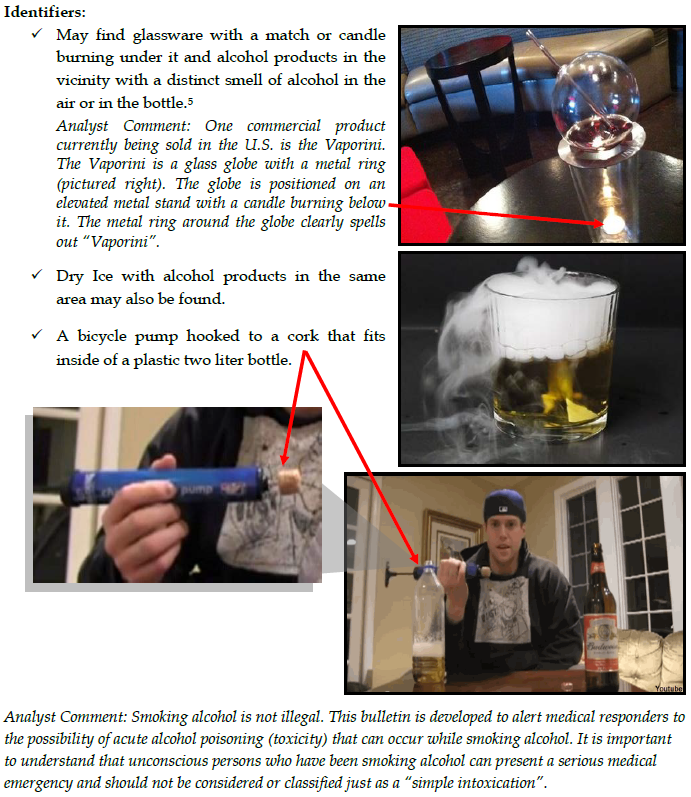 Detailed instructions on the internet teach a viewer how to add dry ice to an alcoholic beverage and breathe in the vapors as they are released out of the bottle. Another method is to heat the glass containing the alcohol beverage. This releases the alcohol vapors into the bottle and it is subsequently inhaled using a straw. The third method is to pressurize the bottle using a cork and a bicycle pump. Once pressurized, the cork is rapidly removed. The sudden change in pressure vaporizes the alcohol in the air space of the bottle and the user then inhales the vapors. All methods are efficient and cause almost instantaneous effects. Instead of waiting 20 minutes for a buzz from ingesting alcohol, there is a large degree of intoxication and impairment very quickly after it is inhaled. The danger of smoking alcohol is related to the rapid absorption of alcohol into the blood stream and its effects on the brain. When a person binge drinks too quickly the result is nausea and vomiting. In addition, when alcohol is absorbed from the intestines it makes a direct route through the liver assisting in the detoxification. This often prevents alcohol poisoning. But, when alcohol vapors are inhaled these protective processes do not occur. Instead, large amounts of alcohol can enter the blood stream move directly to the brain and cause alcohol poisoning (toxicity).